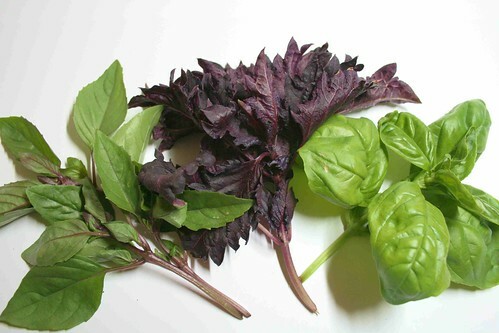 I know that fresh basil is pretty much available year-round now in the markets. And I purchase it throughout the year. Still having my own basil plant right outside my back door is a summer pleasure that I look forward to. Temperamental little plants, they need temperatures above 50° F at all times to thrive. So in my area, May is the earliest we can plant it outdoors. Last night my kitchen was filled with the wonderful sweet-spicy fragrance of this gorgeous herb. I wasn’t cooking with it but simply needed to pinch back my plants to they wouldn’t get too leggy. I’ll keep all those little pinched off sprigs and dry them for use next winter if they don’t get used fresh in the next day or so. If nothing else just inhaling the fragrance is enough to make me happy!